Grain is your beer’s base and the most expensive ingredient. Originally created as a forum FAQ, this guide provides a high-level understanding of grain and malt handling and helps old brewers and new hires alike maximize this input. This guide covers strategy, policy, and important points and reminders. Malt is your beer’s most expensive ingredient and the prices are highly volume-sensitive; The goal is to make the largest orders possible without stock going bad or running out and halting production. 1. Use Your Malt Within About 3 Months. (This time is less when using BBUs, bags, or within hot and humid environments, and more in cool, dry climates.) As far as spoiling and most recommendations go, 3 months is erring on the side of caution. But staling impacts your beer long before it spoils. Grain lasts but don’t push it. Lead times are real and production delays hurt; any lost savings on grain serve as insurance against inventory gaps. Not to mention that suppliers like extra notice. Keep lead times in mind and stick with suppliers who prove themselves reliable. 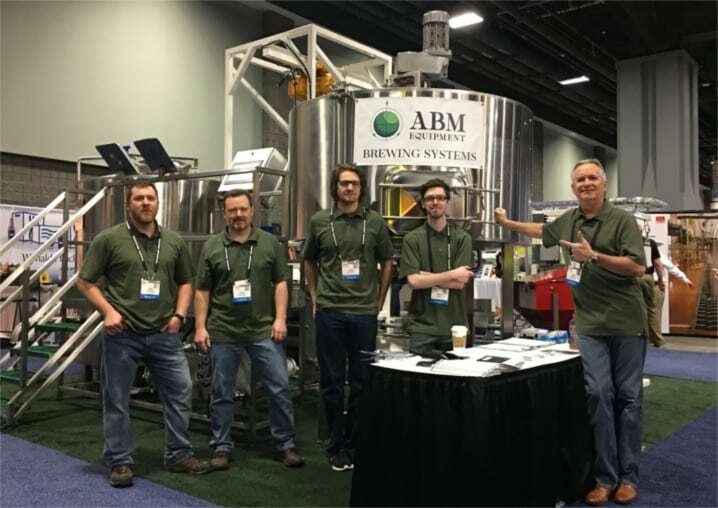 Smaller breweries can do with a simple chart to manage inventory, but larger operations that change recipes often may benefit from supply-chain management software. 4. Rotate Your Specialty Stock. It can be tempting to throw the new stuff on the old, so if hired hands are receiving product keep them accountable. These are not recommended because malt begins to degrade immediately after milling. As product is ground its surface area increases exponentially, exposing it to much more oxygen. These are usually shipped in units of about 40 bags per pallet and require a pallet jack at minimum. A forklift is preferred because they allow use of pallet racks, which provide savings on shipping costs. Remember to rotate stock to prevent oxidation or staling. Forklifts and bulk bag unloaders are necessary for this option, but they’re preferable to 50 lb. 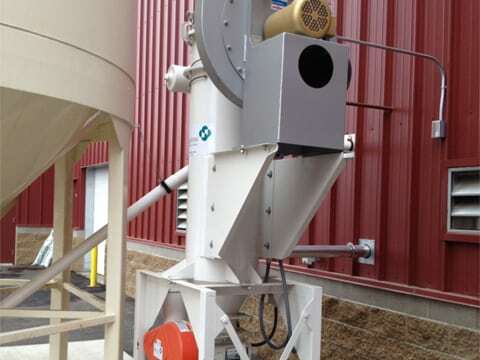 bags, require little handling, and can dump straight into an auger or tubular drag system. 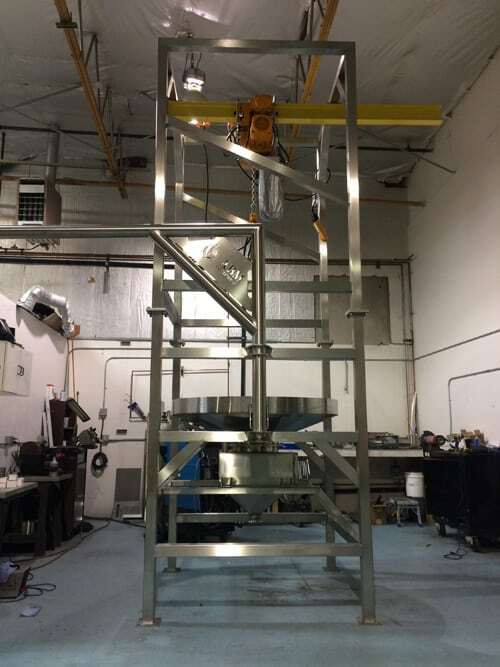 If no forklift will be used for loading the bulk bag unloader, it can be outfitted with a hoist and trolley for easy bag placement. But since this feature will bring the price near that of a silo, it’s seldom used in any other circumstance. Silos are typically used for base malts (e.g. 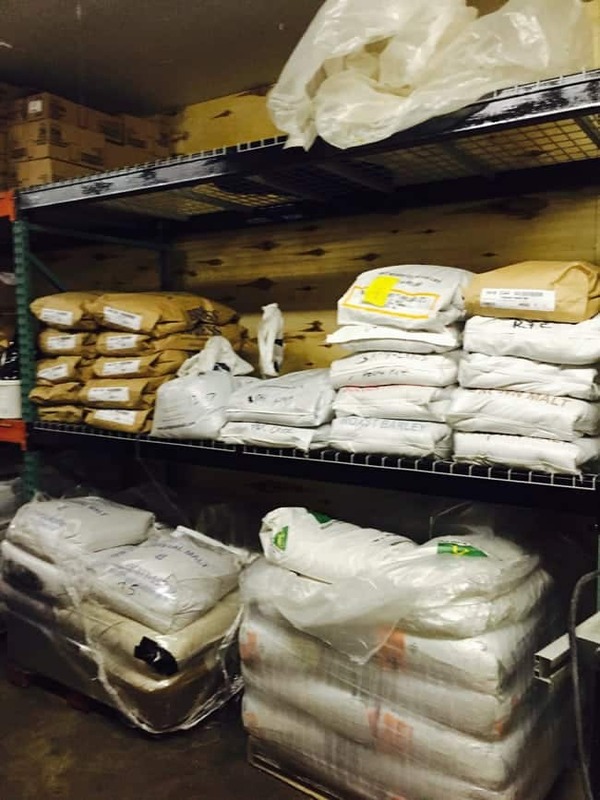 2 row or Pilsner malt); specialty malt can be handled via bulk sacks or bagged malt. Breweries that produce upwards of ~2,000 BBLs annually will start to see a good ROI for a silo system. Startups with an eye on production should keep future silo placement in mind when choosing their space. Other advantages of bulk receiving is the reduced effort & risk of injury for workers. Delivery via truck is the most common method; rail cars are practical for large breweries. Once rodents, birds, and insects are attracted, they’re hard to get rid of. Use the correct equipment, float malt pallets away from walls, and sweep around them as needed. 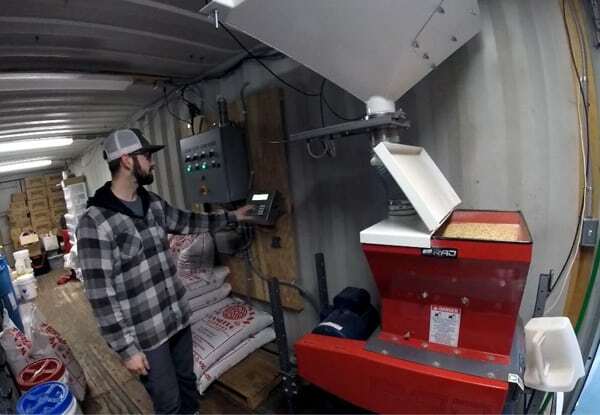 A typical truckload of bulk malt can be anywhere between 15 – 65 tons depending on type, and there are multiple off-loading options. 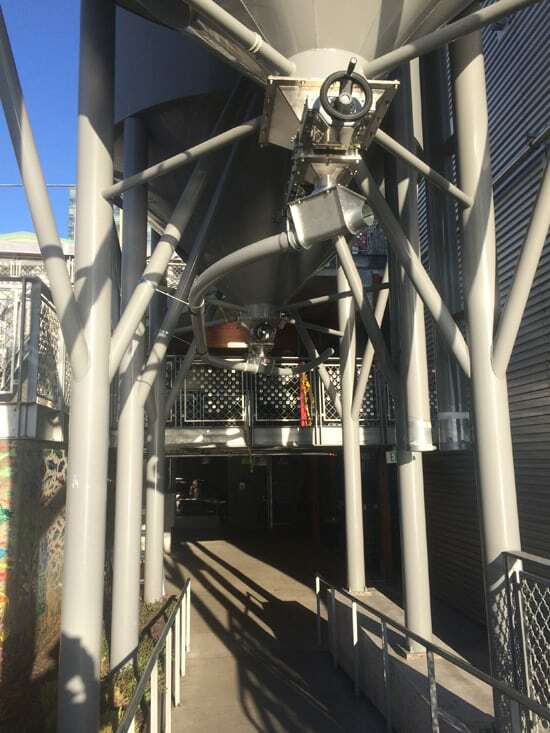 The most common method is a PD truck that pneumatically blows the malt into the top of the silo. It is advisable to have a brewery team member present during delivery to ensure the truck operator doesn’t push the malt at over ~3.5 p.s.i. Higher pressures and faster rates will damage malt and create unnecessary dust. 2-3 hours to unload a truck is completely normal. Some types and grades of product can be pushed at up to 5 psi, but some can’t withstand anything over 3. Start with three, work your way up to your limit, then respect it. Dust buildup is another reason silos should be emptied periodically, as fines in a mix rise to the top. Not only do they degrade immediately and are unfit for brewing, but they attract infestation.) 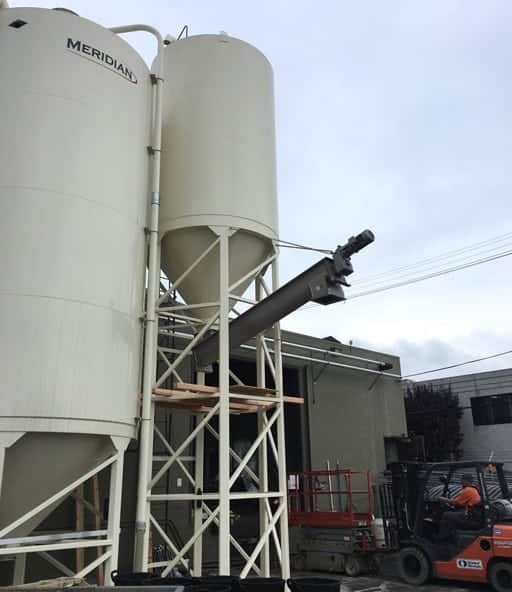 Put a filter bag on the silo exhaust vent – otherwise the dust will be significant and will create an unsightly layer that, again, attracts rodents and insects. Most silos gradually leak dust through the discharge gate. Make sure your integrator has a practical solution to prevent this. If they don’t know what you’re talking about, you may need to talk to someone else. The more surface area grain has, the less time it needs to spoil. And since grain dust has so much surface area that it spoils instantaneously, the goal is to convey as gently as possible, and get the grain from point A to point B as quickly as possible. 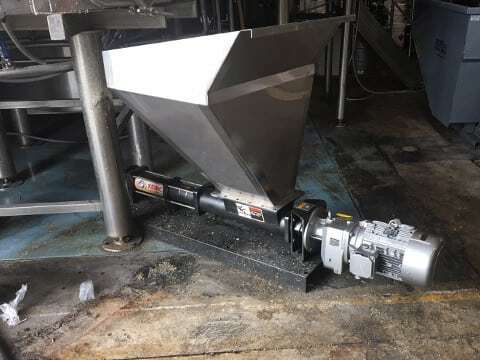 Reducing conveying time and friction (especially from mill to mash) will increase yield and reduce dust. PROs: Ultra-fast, ultra gentle on product. CONs: Take up a lot of space, somewhat expensive. 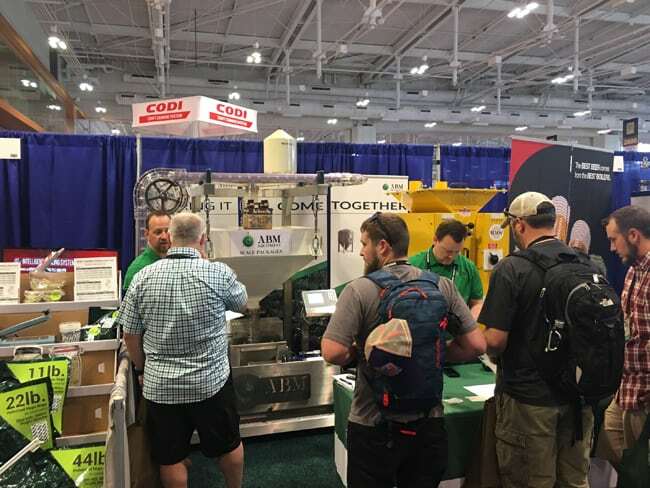 You’re looking for a roller mill with the correct rate and efficiency. Don’t be fooled by high rate mills with super low price tags. It doesn’t do you any good if your mill doesn’t crush grain small enough or it breaks constantly. The cheapest brand most brewers can get away with is RAD. Larger breweries and most distilleries, (corn is harder on mills) need a better make. We personally recommend and use RMS for such applications. Excessive airborne debris is hard on the lungs and creates cleanliness and safety issues, particularly when wet. Again, it can also attract insects and rodents. 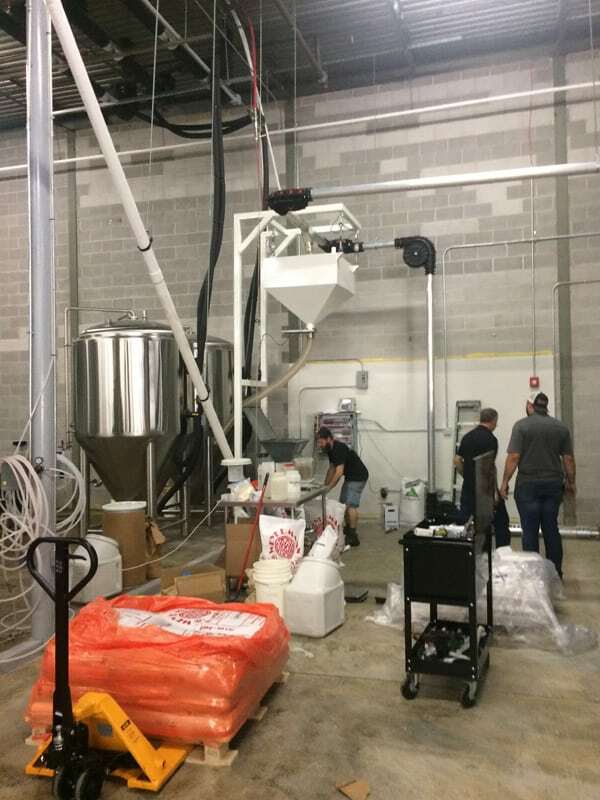 A brewery’s need for dust collection is completely situational. Some small breweries create so much dust that they’re necessary and some large breweries create so little that they’re not. 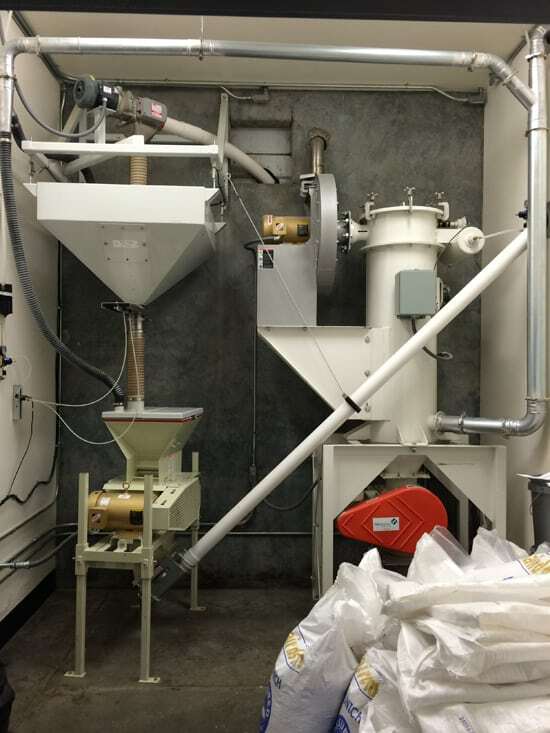 It depends on a lot of factors like the process itself, how contained the mill area is… who integrated the grain handling system, etc. Unfortunately, many cities have strong opinions on this and will make the decision for you. 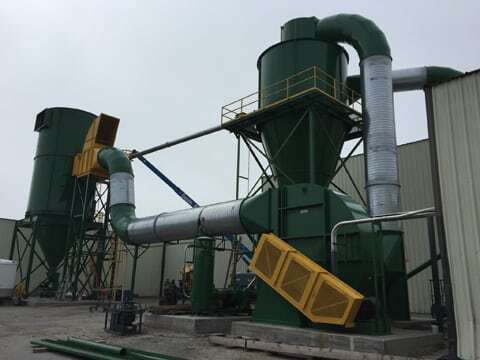 Fortunately, dust collection systems come in all shapes, sizes, and are occupying progressively smaller footprints. The devil’s in the details, and automated malt handling eliminates a lot of time-consuming tasks and reduces brain clutter. There isn’t a particular threshold where you should begin thinking about automation because once the equipment is in place the cost of basic automation is negligible. We make systems as complex or simple as needed. You can hit “convey”, “stop”, “grind”, etc. manually, or the brewer can hit “X barrels” of “Y beer” from a touch pad and the rest happens automatically. Our most common solution involves a controller with programmable recipes and will automate multiple inputs. (Specialty batches are usually done by hand.) If the operator wants 450 lbs. of 2-row in the mash, malt will be brought in and crushed in 100 lb. intervals. This process will happen 4.5 times in this scenario, at which point the grist case will dump into the mash. Having been soaked but never reaching boiling temperature, spent grain spoils fast and dries hard. It smells, it’s heavy, and no one wants to deal with it. But with some diligence, up-front investment, and a plan, it can be relatively painless. Pumps will run you about 40 grand, so it’s up to you whether the savings on labor, liability, and messiness are worth it to you. As a rule of thumb, they start paying for themselves when you’re reaching capacity on a 15bbl system. Traditional cavity pumps burn out quickly when running dry. Some of them have thermal shut-off sensors, but as they rely on heat generated from running dry, the damage is done by the time they’re triggered. For this reason we almost exclusively recommend Xeric pumps. Spent grain can be used in baked goods if it’s dried or used immediately. You’ll be creating so much of it that you’ll need to compost it or have a farmer take it for livestock. Farmers will usually pay for it, but there needs to be a pick up at least once per day. Luckily, livestock need to eat more often than that.